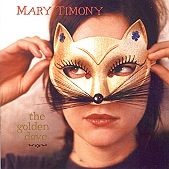 Helium frontwoman Mary Timony's second solo outing, The Golden Dove, finds the singer-songwriter crafting songs on both the dark and the melodic side of things. Her lyrical content is similar to her debut, with her either coming out and saying what she's getting at or coding everything for the listener to decipher. The album opens with a bouncy, semi-jangly indie-rock ditty, "Look a Ghost in the Eye", which manages to stay ahead of the indie bell curve, adding eerie strings and a dark(er) feel to the song, helping to propel it above your cliched indie-rock offering. "The Owl's Escape" is a haunting piano ballad, strings adding a moan, and Timony's voice lightening things up. "Musik and Charming Melodee" picks the pace back up with a mid tempo rocker, still strong on the melody, but not shy about wanting to elevate itself up above some of the slower, more methodical material on the album. And then there is "Ant's Dance", a melodic pop song paying homage to folk and Celtic influences. Timony manages to once again expand beyond what she did in Helium, without the listener longing for the band, or Timony sounding lost without them. This is a solid offering, a melancholy record that takes chances and shows growth. I'll give it an A-.